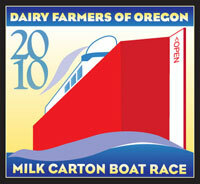 My favorite Rose Festival affiliated event, the Milk Carton Boat Races, takes place this Sunday, June 13th at the casting pond in Westmoreland Park. Races begin at 11am. Heather and I, with our friends Katie and Justin, attended last year’s event. I was disappointed there was no beer garden, but the event sponsors, the Dairy Farmers of Oregon, did hand out a bunch of freebies, including root beer floats! We recommend you bring a blanket or some camp chairs, and a picnic lunch (but if you forget your lunch, you’re in luck: on Twitter it was announced that both Koi Fusion and Burgerville’s Nomad will make an appearance at this year’s race). We’ll definitely be in attendance on Sunday: friend of the blog Mike Vogel, is creating a boat in the Showboat category for this year’s event! Fortunately it’s supposed to be warm because I’m confident my boat will capsize at some point early in the event.